The file ending with “Version1” contains code to simulate a proton in an electric field using the non-relativistic acceleration derived above. (This code uses the “Euler algorithm” described in the “Theory” section.) Execute this code, and look at the plots of position versus time and speed versus time. Explain why these plots have the shapes that they have. The file ending with “Version2” contains the same code as the file ending with “Version1” except that a few lines have been added in order to also calculate and plot the non-relativistic energy. Locate the line where the non-relativistic energy is calculated. (The same line appears both inside the loop and before the loop.) Explain why this line is correct. You will need to be very careful with the units and the factors of c2cstyle="padding-top: 0px; padding-right: 0px; padding-bottom: 0px; padding-left: 0px; border-top-style: none; border-top-width: 0px; border-right-style: none; border-right-width: 0px; border-bottom-style: none; border-bottom-width: 0px; border-left-style: none; border-left-width: 0px; display: inline; margin-top: 0px; margin-right: 0px; margin-bottom: 0px; margin-left: 0px; line-height: normal">2style="padding-top: 0px; padding-right: 0px; padding-bottom: 0px; padding-left: 0px; border-top-style: none; border-top-width: 0px; border-right-style: none; border-right-width: 0px; border-bottom-style: none; border-bottom-width: 0px; border-left-style: none; border-left-width: 0px; display: inline; margin-top: 0px; margin-right: 0px; margin-bottom: 0px; margin-left: 0px; line-height: normal">style="padding-top: 0px; padding-right: 0px; padding-bottom: 0px; padding-left: 0px; border-top-style: none; border-top-width: 0px; border-right-style: none; border-right-width: 0px; border-bottom-style: none; border-bottom-width: 0px; border-left-style: none; border-left-width: 0px; display: inline; margin-top: 0px; margin-right: 0px; margin-bottom: 0px; margin-left: 0px; line-height: normal">style="padding-top: 0px; padding-right: 0px; padding-bottom: 0px; padding-left: 0px; border-top-style: none; border-top-width: 0px; border-right-style: none; border-right-width: 0px; border-bottom-style: none; border-bottom-width: 0px; border-left-style: none; border-left-width: 0px; display: inline; margin-top: 0px; margin-right: 0px; margin-bottom: 0px; margin-left: 0px; line-height: normal">. Write down the equation for non-relativistic energy (including both rest energy and non-relativistic kinetic energy), and carefully argue why this line of code is correct. Execute this code, and look at the plot of energy versus time. Why does this plot have the shape that it has? How large is the kinetic energy compared to the rest energy after the proton has been accelerating for 1 second? from the equation F=dp/dtFstyle="padding-top: 0px; padding-right: 0px; padding-bottom: 0px; padding-left: 0px; border-top-style: none; border-top-width: 0px; border-right-style: none; border-right-width: 0px; border-bottom-style: none; border-bottom-width: 0px; border-left-style: none; border-left-width: 0px; display: inline; margin-top: 0px; margin-right: 0px; margin-bottom: 0px; margin-left: 0px; line-height: normal">=style="padding-top: 0px; padding-right: 0px; padding-bottom: 0px; padding-left: 0px; border-top-style: none; border-top-width: 0px; border-right-style: none; border-right-width: 0px; border-bottom-style: none; border-bottom-width: 0px; border-left-style: none; border-left-width: 0px; display: inline; margin-top: 0px; margin-right: 0px; margin-bottom: 0px; margin-left: 0px; line-height: normal">dstyle="padding-top: 0px; padding-right: 0px; padding-bottom: 0px; padding-left: 0px; border-top-style: none; border-top-width: 0px; border-right-style: none; border-right-width: 0px; border-bottom-style: none; border-bottom-width: 0px; border-left-style: none; border-left-width: 0px; display: inline; margin-top: 0px; margin-right: 0px; margin-bottom: 0px; margin-left: 0px; line-height: normal">pstyle="padding-top: 0px; padding-right: 0px; padding-bottom: 0px; padding-left: 0px; border-top-style: none; border-top-width: 0px; border-right-style: none; border-right-width: 0px; border-bottom-style: none; border-bottom-width: 0px; border-left-style: none; border-left-width: 0px; display: inline; margin-top: 0px; margin-right: 0px; margin-bottom: 0px; margin-left: 0px; line-height: normal">/style="padding-top: 0px; padding-right: 0px; padding-bottom: 0px; padding-left: 0px; border-top-style: none; border-top-width: 0px; border-right-style: none; border-right-width: 0px; border-bottom-style: none; border-bottom-width: 0px; border-left-style: none; border-left-width: 0px; display: inline; margin-top: 0px; margin-right: 0px; margin-bottom: 0px; margin-left: 0px; line-height: normal">style="padding-top: 0px; padding-right: 0px; padding-bottom: 0px; padding-left: 0px; border-top-style: none; border-top-width: 0px; border-right-style: none; border-right-width: 0px; border-bottom-style: none; border-bottom-width: 0px; border-left-style: none; border-left-width: 0px; display: inline; margin-top: 0px; margin-right: 0px; margin-bottom: 0px; margin-left: 0px; line-height: normal">dstyle="padding-top: 0px; padding-right: 0px; padding-bottom: 0px; padding-left: 0px; border-top-style: none; border-top-width: 0px; border-right-style: none; border-right-width: 0px; border-bottom-style: none; border-bottom-width: 0px; border-left-style: none; border-left-width: 0px; display: inline; margin-top: 0px; margin-right: 0px; margin-bottom: 0px; margin-left: 0px; line-height: normal">tstyle="padding-top: 0px; padding-right: 0px; padding-bottom: 0px; padding-left: 0px; border-top-style: none; border-top-width: 0px; border-right-style: none; border-right-width: 0px; border-bottom-style: none; border-bottom-width: 0px; border-left-style: none; border-left-width: 0px; display: inline; margin-top: 0px; margin-right: 0px; margin-bottom: 0px; margin-left: 0px; line-height: normal">style="padding-top: 0px; padding-right: 0px; padding-bottom: 0px; padding-left: 0px; border-top-style: none; border-top-width: 0px; border-right-style: none; border-right-width: 0px; border-bottom-style: none; border-bottom-width: 0px; border-left-style: none; border-left-width: 0px; display: inline; margin-top: 0px; margin-right: 0px; margin-bottom: 0px; margin-left: 0px; line-height: normal">. See the “Theory” section for additional background. Compute the value of the Lorentz factor, γγstyle="padding-top: 0px; padding-right: 0px; padding-bottom: 0px; padding-left: 0px; border-top-style: none; border-top-width: 0px; border-right-style: none; border-right-width: 0px; border-bottom-style: none; border-bottom-width: 0px; border-left-style: none; border-left-width: 0px; display: inline; margin-top: 0px; margin-right: 0px; margin-bottom: 0px; margin-left: 0px; line-height: normal">style="padding-top: 0px; padding-right: 0px; padding-bottom: 0px; padding-left: 0px; border-top-style: none; border-top-width: 0px; border-right-style: none; border-right-width: 0px; border-bottom-style: none; border-bottom-width: 0px; border-left-style: none; border-left-width: 0px; display: inline; margin-top: 0px; margin-right: 0px; margin-bottom: 0px; margin-left: 0px; line-height: normal">. Use the Lorentz factor to compute the acceleration. Modify the equation for the energy (both before the loop and within the loop) in order to compute the relativistic energy. Hint: Once you have computed the Lorentz factor, the relativistic energy is actually very simple to compute, but be very careful of the units and factors of c2cstyle="padding-top: 0px; padding-right: 0px; padding-bottom: 0px; padding-left: 0px; border-top-style: none; border-top-width: 0px; border-right-style: none; border-right-width: 0px; border-bottom-style: none; border-bottom-width: 0px; border-left-style: none; border-left-width: 0px; display: inline; margin-top: 0px; margin-right: 0px; margin-bottom: 0px; margin-left: 0px; line-height: normal">2style="padding-top: 0px; padding-right: 0px; padding-bottom: 0px; padding-left: 0px; border-top-style: none; border-top-width: 0px; border-right-style: none; border-right-width: 0px; border-bottom-style: none; border-bottom-width: 0px; border-left-style: none; border-left-width: 0px; display: inline; margin-top: 0px; margin-right: 0px; margin-bottom: 0px; margin-left: 0px; line-height: normal">style="padding-top: 0px; padding-right: 0px; padding-bottom: 0px; padding-left: 0px; border-top-style: none; border-top-width: 0px; border-right-style: none; border-right-width: 0px; border-bottom-style: none; border-bottom-width: 0px; border-left-style: none; border-left-width: 0px; display: inline; margin-top: 0px; margin-right: 0px; margin-bottom: 0px; margin-left: 0px; line-height: normal">style="padding-top: 0px; padding-right: 0px; padding-bottom: 0px; padding-left: 0px; border-top-style: none; border-top-width: 0px; border-right-style: none; border-right-width: 0px; border-bottom-style: none; border-bottom-width: 0px; border-left-style: none; border-left-width: 0px; display: inline; margin-top: 0px; margin-right: 0px; margin-bottom: 0px; margin-left: 0px; line-height: normal">. Execute your modified program, and fix any bugs! Execute your modified program (Version3) using a maximum time of 5 seconds, and look at the plot of speed versus time. Does the plot look better than the plot that you looked at in Exercise 3? It should! If it doesn’t, there is a bug in your code that needs to be fixed before you continue. Explain why the new plot of speed versus time has the shape that it has. Add code to your program (after the program’s loop has completed) to compute the kinetic energy both analytically and numerically. Print both results, and make sure that they are similar. (If they aren’t you need to fix something!) Compute the percent error in the numerical kinetic energy. How large is the error? Increase the value of your program’s time step by a factor of 10. How does this affect the error? Why does this happen? (This code uses the “Euler algorithm” described in the “Theory” section.) Before you continue to the next exercise, make sure that the error is a small fraction of a percent. At the Large Hadron Collider (LHC), protons are accelerated to an energy of 8 TeV. 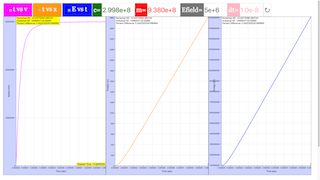 Instead of using a longer simulation, extrapolate your results in order to determine how long it would take to accelerate a proton up to E=8Estyle="padding-top: 0px; padding-right: 0px; padding-bottom: 0px; padding-left: 0px; border-top-style: none; border-top-width: 0px; border-right-style: none; border-right-width: 0px; border-bottom-style: none; border-bottom-width: 0px; border-left-style: none; border-left-width: 0px; display: inline; margin-top: 0px; margin-right: 0px; margin-bottom: 0px; margin-left: 0px; line-height: normal">=style="padding-top: 0px; padding-right: 0px; padding-bottom: 0px; padding-left: 0px; border-top-style: none; border-top-width: 0px; border-right-style: none; border-right-width: 0px; border-bottom-style: none; border-bottom-width: 0px; border-left-style: none; border-left-width: 0px; display: inline; margin-top: 0px; margin-right: 0px; margin-bottom: 0px; margin-left: 0px; line-height: normal">8style="padding-top: 0px; padding-right: 0px; padding-bottom: 0px; padding-left: 0px; border-top-style: none; border-top-width: 0px; border-right-style: none; border-right-width: 0px; border-bottom-style: none; border-bottom-width: 0px; border-left-style: none; border-left-width: 0px; display: inline; margin-top: 0px; margin-right: 0px; margin-bottom: 0px; margin-left: 0px; line-height: normal">style="padding-top: 0px; padding-right: 0px; padding-bottom: 0px; padding-left: 0px; border-top-style: none; border-top-width: 0px; border-right-style: none; border-right-width: 0px; border-bottom-style: none; border-bottom-width: 0px; border-left-style: none; border-left-width: 0px; display: inline; margin-top: 0px; margin-right: 0px; margin-bottom: 0px; margin-left: 0px; line-height: normal"> TeV using ϵ=1ϵstyle="padding-top: 0px; padding-right: 0px; padding-bottom: 0px; padding-left: 0px; border-top-style: none; border-top-width: 0px; border-right-style: none; border-right-width: 0px; border-bottom-style: none; border-bottom-width: 0px; border-left-style: none; border-left-width: 0px; display: inline; margin-top: 0px; margin-right: 0px; margin-bottom: 0px; margin-left: 0px; line-height: normal">=style="padding-top: 0px; padding-right: 0px; padding-bottom: 0px; padding-left: 0px; border-top-style: none; border-top-width: 0px; border-right-style: none; border-right-width: 0px; border-bottom-style: none; border-bottom-width: 0px; border-left-style: none; border-left-width: 0px; display: inline; margin-top: 0px; margin-right: 0px; margin-bottom: 0px; margin-left: 0px; line-height: normal">1style="padding-top: 0px; padding-right: 0px; padding-bottom: 0px; padding-left: 0px; border-top-style: none; border-top-width: 0px; border-right-style: none; border-right-width: 0px; border-bottom-style: none; border-bottom-width: 0px; border-left-style: none; border-left-width: 0px; display: inline; margin-top: 0px; margin-right: 0px; margin-bottom: 0px; margin-left: 0px; line-height: normal">style="padding-top: 0px; padding-right: 0px; padding-bottom: 0px; padding-left: 0px; border-top-style: none; border-top-width: 0px; border-right-style: none; border-right-width: 0px; border-bottom-style: none; border-bottom-width: 0px; border-left-style: none; border-left-width: 0px; display: inline; margin-top: 0px; margin-right: 0px; margin-bottom: 0px; margin-left: 0px; line-height: normal"> Volt/meter. How far does the proton travel during this time? How many trips around the LHC would the proton make during this time? How does this distance compare to the circumference of the Earth’s orbit around the sun?